The artist for this line is downsizing and many of the items will no longer be available. We are fine tuning our offerings now. Before ordering, please click here to contact us first to be sure your item is available. 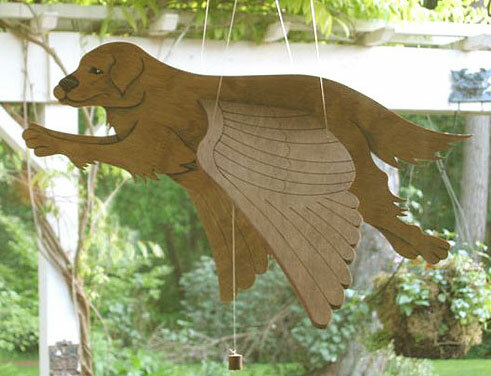 One of our most prized possessions is a flapping-winged retriever mobile that hangs from the divide between our kitchen and family room. 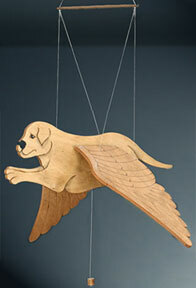 We have had this handcrafted wooden winged messenger since 2002 and it looks as perfect as the day we received it. For that reason, we are thrilled to be able to carry this inspiring and joyful line here at our Land of PureGold. This line features over 100 handcrafted designs of mobiles that represent a wide variety of animals and creatures, both real and imaginary. Each mobile consists of a body with an attached pair of wings, suspended from a hanging assembly and carefully balanced so that a tug on the body or a gentle breeze causes the wings to flap. These winged wonders are made from furniture grade birch plywood, further detailed with wood-burning, and then decorated with exterior-grade enamel paint and oil stain. Some of the pieces have gorgeous etched acrylic wings instead of wood. There is additionally an assortment of 50 miniatures and a variety of collector displays in which to showcase them. In their studio and workshop in southwestern New Hampshire, Peggy and Rich Roth work together to make these stunning handcrafted items. Peggy, a graduate of Pratt Institute, created these original designs and is the artistic half of the partnership, but she relies on Rich to keep the business running. Since 1993 Peggy has been a state-juried member of The League of New Hampshire Craftsmen, one of the oldest and most respected craft organizations in the country. Membership is achieved only after an artisan's craft is subjected to a rigorous jurying process by their peers. The mobiles are weather-resistant and can withstand moisture. However, they should not be directly exposed to nature (snow, rain, wind, etc.). We recommend that if one is hung outside, it should be in a protected area such as a gazebo or a porch, as shown here. Actually pieces of art, these wonders are signed, dated, and numbered by the artist under the left wing. The entire line of products are crafted to order, with a turnaround time of about three weeks. All designs arrive folded flat—ready to display with no assembly required. IMPORTANT NOTE: These items ship directly from Peggy Rich's Studio and arrive separately from other lines of items at the Land of PureGold. The line is only available for shipment in the United States. QUALITY GUARANTEE: Items that do not meet your expectations may be returned for replacement or refund within 30 days of the date received. Shipping charges are non-refundable unless you received a damaged item. If your order arrives damaged, please save the packaging material so that a claim can be filed with the shipper. Please contact us for complete return instructions. If any of the strings—used for the hanging assembly or wing hinges—break at any time and for any reason, they will be replaced free of charge. Customers, however, are responsible for shipping charges. Be sure to contact us before returning any item. In some cases, it may be possible for you to repair items with materials and help from the manufacturer, which would save time and shipping costs. We have housed our flapper indoors, and in 6 years, there has not been any string breakage, our delightful piece as beautiful and functional as the day it was received. However, outside use will subject your flapper to more movement and thus potential for greater string wear and need for replacement.